TEHRAN, Iran (CNN) -- It's a first for Iran: a series of debates televised live ahead of the upcoming presidential elections next week. And Wednesday's was one to remember. 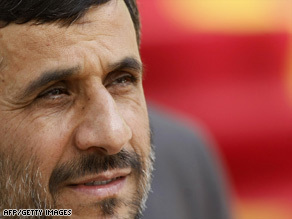 President Mahmoud Ahmadinejad is known for his fiery attacks on his foes. President Mahmoud Ahmadinejad, known for his fiery attacks on his foes, unleashed a mouthful Wednesday against Iran's former presidents Mohammad Khatami and Akbar Hashemi Rafsanjani, whom he accused of colluding with his chief rival, the semi-official Fars news agency reported. Ahmadinejad, seeking a second term in office, accused the two Iranian figures of mismanagement, corruption and masterminding a plot to push him out of power, according to Fars. "I have tolerated all the personal insults and lies for four years and I forgive those responsible for them," Ahmadinejad said. "But I do not have the authority to turn a blind eye when the people and the people's choice and their interests are insulted." The verbal attacks surfaced during a heated debate that lasted an hour and half between Ahmadinejad and opponent Mir Hossein Mousavi, a former prime minister and reformist candidate who poses a threat to the firebrand Iranian president. Ahmadinejad accused Mousavi and the two former leaders of standing against the Iranian nation and conspiring against him. Fars reported that he said in the early days of Ahmadinejad's presidency, Rafsanjani sent a message to the king of a Persian Gulf state that said: "Do not worry. This government will fall within six months." Rafsanjani, a powerful cleric who heads the Expediency Council and Assembly of Experts, remains an influential figure in Iran. He was president from 1989 to 1997 and then attempted to position himself in the political center in the 2005 elections, when he publicly favored a policy that would relax tensions with the United States. The two nations have had no diplomatic ties since the 1979 Islamic Revolution. Rafsanjani lost to the ultra-conservative Ahmadinejad, who was then Tehran's mayor. Since then, Ahmadinejad has lashed out at Israel, the United States and questioned on several occasions whether the Holocaust occurred. The Iranian president repeated some of those remarks earlier Wednesday, calling the Holocaust, in which six million Jews perished at the hands of the Nazis, "a big deception," according to state-run Press TV. In the rare debate, Mousavi responded by arguing that Ahmadinejad's dictatorial ways have tainted Iran's image. "There are two ways of confronting the country's problems," Mousavi said. "One is through a management style based on adventurism, instability, play-acting, exaggerations, wrongdoing, being secretive, self-importance, superficiality and ignoring the law. The second way is based on realism, respect, openness, collective wisdom and avoiding extremism." Mousavi said Ahmadinejad's denials of the Holocaust had repulsed Iran's allies. "This has greatly damaged us," he said. In addition to Mousavi, two other challengers -- former parliament speaker Mahdi Karoudi, another reformist, and hardliner Mohsen Rezaei, secretary of Iran's Expediency Council -- are hoping to unseat Ahmadinejad in the June 12 election. The outcome of the election will set the tone of Iran's policies on crucial issues, including the possibility of bilateral talks with Washington and its nuclear ambitions. CNN's Shirzad Bozorgmehr in Tehran contributed to this story.